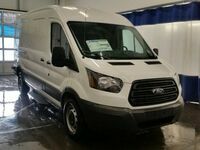 For an efficient hauler, you can't do any better than this Ford Transit. This Ford Transit offers the flexibility to fit any size of business, whether you need to tow, haul, cart, carry or deliver - the Ford Transit can get it done. The Ford Transit workspace is carefully designed to maximize efficiency and versatility, making your Transit the ideal tool for any job. This oxford white van has an automatic transmission and is powered by a 3.7L V6 24V MPFI DOHC engine. Total rebate of $3250 is reflected in the price. Credit includes $2500 Delivery Allowance. Includes $750 Cash Bonus. 6.29% financing for 72 months. Incentives expire 2019-04-30. See dealer for details.